Golf ChannelTiger Woods continued his miraculous comeback run by sinking a 71-foot putt on one of his final holes on Thursday in the first round of the Arnold Palmer Invitational. Tiger Woods’ return to golf took yet another step forward on Thursday as he led through much of the day at the Arnold Palmer Invitational. 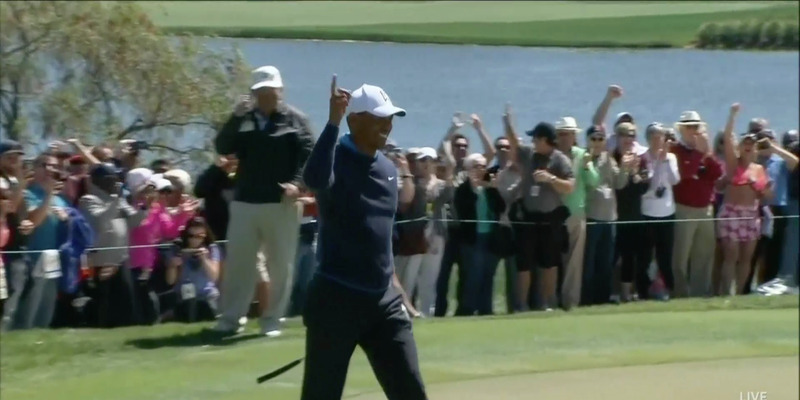 The highlight of Woods’ round came at the 7th hole, where he sank a 71-foot (21-metre) putt for birdie to the raucous cheers of the crowd. Woods’ resurgence has golf fans filled with anticipation about his upcoming return to the Masters Tournament. Tiger Woods’ return has taken the golfing world by storm over the past few weeks, and with good reason. Last weekend at the Valspar Championship, Woods sunk a 44-foot birdie on the 17th hole to bring himself within one stroke of the lead. While his final birdie putt of the round would fall two feet short of forcing a playoff, Tiger prowling in his Sunday red was a sight to behold. On Thursday, Tiger kept his momentum going, sinking three birdies through his first nine holes and keeping his name at or around the top of the leaderboard all day. The highlight of his round came at the 7th hole, where Woods once again showed off his range at the putting green. After a slight mishit out of the tee box on the par three, Woods proved that distance was no problem for him, sinking a 71-foot putt with an utterly ridiculous break. When the crowd went wild as the ball found its home, all Woods could do was smile. Woods’ comeback has made for a thrilling start to the golf season – so much that ticket prices for the Masters Tournament are skyrocketing in anticipation. After his second-place finish last weekend, he’ll look to keep up his pace this weekend at the Arnold Palmer Invitational and get his first win since 2013.